Here is the story of the cover of Robert's recent book, Snuff Fiction. 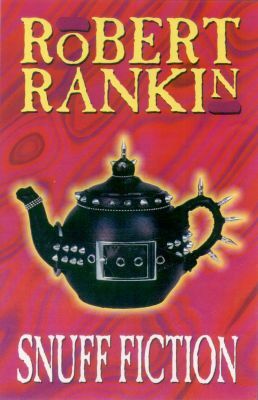 For the last few books Robert Rankin has been designing his own book covers. In fact they have been so well received that he has started redesigning the covers of some of his older books. The new covers are models which Robert makes out of chicken wire, plaster of Paris, bits of material and other stuff he finds around. He makes the model, it is photographed and a graphic designer finishes it off. Since his first cover, Dance of the Voodoo Handbag, Robert has gradually been getting more adventerous, until he got to Snuff Fiction when he went for a rather risqué model of a scantily clad female sitting on a box of snuff. At this point, however, the publishers put their foot down. They rejected the cover on the grounds that it was "too politically incorrect". So Robert went back to the drawing board. Or the sculpting table. Or whatever. He thought about replacing the offending lady with with a devil smoking a joint, while sitting on the same snuff box. Eventually he settled for the biker teapot you see before you. Apparently it relates to the story in some way. We may eventually find out how. Despite all the controversy, you have to admit it's a damn fine cover.